I have asked for 1,000 Luxury cards consisting of Full Glossy front image and single colour on the back. The Photo is my own taken during a brief few days which almost closed London down due to lack of planning. The box in the centre is for when I get around to ordering a Dymo Label printer, and made slightly bigger than size of see-thru labels I have seen on their site. My congratulations on your design! It is really professional, 100% suitable for processing. 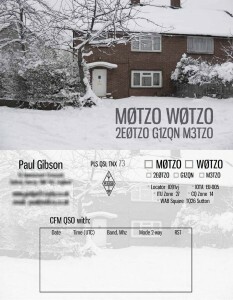 Even had above comment from the QSL printer as I sent my own card design to him. Guess I have no excuses for not working HF now. The Quality of the card image here is deliberately low (186Kb). The working file sizes were 20Mb front image & 9Mb rear image (4.9Mb & 3.5Mb flattened images sent to printer). Those look really terrific, what did you do to create the layout? Peter M3PHP & myself are thinking of doing QSL designs, if you are interested I can let you know if we get out of “I have an idea”stage. It's been 14 years, 8 months, 0 weeks, 4 days, 6 hours and 14 minutes since I gave up smoking. I've not smoked 45893 Cigarettes nor spent £15,259.42. EXC.